Bonsai are trees and plants grown in containers in such a way so that they look their most beautiful--even prettier than those growing in the wild. 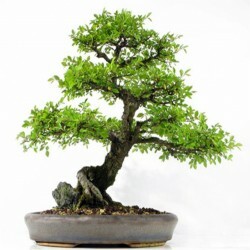 Cultivating bonsai, therefore, is a very artistic hobby. It's also a good illustration of the gentle respect Japanese have for living things and an expression of their sense of what is beautiful. It's much more involved than growing potted flowers, and requires a much bigger commitment-physically and emotionally. An evergreen Tree growing to 18m at a slow rate. It is hardy to zone 8. It is in leaf all year, in..
An evergreen Tree growing to 18m at a slow rate. It is hardy to zone 8. It is in leaf all year, in f..
American holly is an elegant evergreen tree that's ideal for home landscapes. Its dense branching,..
A slow-growing, spreading-canopied deciduous tree, American hornbeam is native to southeastern Nor..